I’d like to be in America! I’d like to be in America, everything’s ‘private’ in America…….. Excuse my shameless abuse of the words of the song, but it seems to be appropriate to the thinking of Bury Borough Council. See Independent article link below. It makes very interesting reading for all of us in local government, as do some of the readers’ comments below it. Hiving everything public off to the private sector and repatriating the business rates to ‘free’ local government from the central grant system, has a very American feel to it – and not in a good way. I continue to be disappointed that the existing local government machine cannot figure out how to more closely align itself to the way the private sector does business, so as to survive the turmoil that is being imposed on it by central government cuts. Obviously part of it will be about the terms and conditions that have become so favourable in local government in recent years, compared to the private sector. It may be that we need to go through this ‘destructive’ phase in local government, in order for those who continue to defend this model to ‘wake up and smell the coffee’ as they say. However, we also need to consider if it might only possible to recruit people with a public service ethic, when you make the pay and conditions more favourable that they are in the private sector. I suppose the Holy Grail for this aspect is the volunteer, that extraordinary person who is not only driven by a need to help others, but is also willing to do it for nothing! The alternative to this ideal, is that you accept the profit driven model and along with it the potential for a somewhat different attitude to public/customer service. The problem with culling from local government all those who joined because they saw public service as a noble cause and replacing them with those whose only gaol is the bottom line, is that it is then almost impossible to go back to the good old days. There has been some talk of the John Lewis model working in local government, but this still requires employee buy-in based on profit sharing and would still need those currently in local government to accept, initially at least, reduced pay and conditions of service. Even more worrying for local taxpayers, is the spectre of continued and increasing conflict between central and local government, as more councils change colour from blue (and the occasional yellow) to outraged red. Saturday’s Telegraph readers of the Property section will need to take a large pinch of salt when reading an article written by the Telegraph’s supposed awarding writer, Ian Cowie. Mr Cowie suggests that last week’s Budget is on the whole beneficial to home owners. This may well be true, but what isn’t true ,is what he has to say about the new powers the Localism Bill will give to those home owners. He claims that, ‘……..the Localism Bill should give residents greater power to decide whether or not more fields and woods are bricked over to build new housing,……’ . Now I’m not sure what this chap got his award for, but it wasn’t for demonstrating any expert knowledge of what the government’s ambitions are when it comes to the planning system in this country – ambitions that don’t involve preventing house building! Ian Cowie appears to have missed the bit in the Budget about the planning system being changed to encourage economic growth. That encouragement will take the form of, as various government minister have taken pleasure in saying over the last 12 months, simplifying the system so as to make it far easier to build things. So, whilst localism will give local people a say on the types of development that take place in their area, it will definately not give them any powers to prevent development if it has already been included in the council’s development plan for the area. Nor will communites be able to stop development, and this is the worrying bit, because it has yet to be defined in any useable way, if it is considered sustainable. Disappointing because it needed doing again and because of the huge amount of disgarded alcohol bottles in one very small corner of the open space at Claudette Avenue. 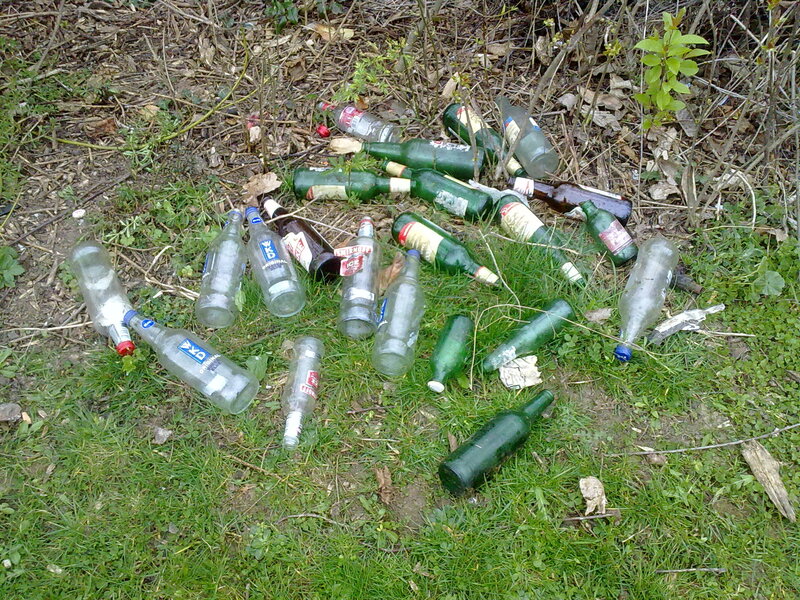 The bottles are yet to be cleared as they need a bit more than a plastic bag – bring on the wheel barrow tomorrow morning. I’ve already collected three large bags of other rubbish and have only covered one side of the road from Wintergold to just past the Claudette Ave open space. Sunday morning will also be spent clearing a large deposit of household refuse that looks as though somebody couldn’t be bothered to wait for the weekly (not fortnightly) refuse collection and just threw it over their garden fence – unbelievable! I also need to organise a dedicated cleanup of one corner of the open space at Claudette Ave due to the large amount of rubbish that has been dumped there. Again, I find it unbelievable that people who live in our community find it acceptable to soil it in this way – messing on your own doorstep and all that! Anybody who would like to help with litter picks please get in touch. A Welsh council has become the first council to be taken over by commissioners following the sacking of Isle of Anglesey CC’s cabinet. Mr Bowles said he had advised the local government minister for Wales to send in commissioners after infighting amongst the independents threatened the council leader’s position. The whole council now faces the threat of an enforced merger with another council unless things improve on the political side (another first I believe). Having written about ‘independent’ councillors before and their potential for a lack of leadership when they are running the council (a bit like herding cats, is my favourite description) I am tempted to crow a bit and say ‘see, I told you so!’. However, I have to temper this with the feeling that the people who are supposed to be represented by these elected members won’t be judging them as ‘independents’, but simply as elected members who have let them down and that is not a good thing for any us, whatever our politics. All of the people all of the time? Will it ever be possible for the planning system to please all of the people all of the time? Of course not, change always brings resistance and when that changes involves, knocking down, build-up or increasing the presence of something, whether it be houses, people, cars or even cows, as in the case of a recent application for a super dairy near Lincoln, you will always get somebody who doesn’t like it. However, you would like to think that you could at least improve the system to the point where it met some of the aspirations of both the public and the profession, for better outcomes based on a more straightforward process. Not so it would appear, if the repsonse of the RTPI to the recent Budget is anything to go by. “If sweeping changes announced to the planning system result in the default position being ‘yes’ to development then there is real danger that within a decade we will end up with an England of tin sheds, Lego land housing and US style shopping malls”. “Where will the incentive be in the future for developers to address issues such as climate change, environmental protection, design quality and affordable housing, if they know that the government has tied the hands of local councillors who will be required to nod through most development proposals. This could mean developers building what they like, where they like, and when they like. It’s a policy that finally buries genuine localism”. (my emphasis). The link below is to the recent speech made by Eric Pickles to the CBI. I’m actually thankful for small mercies when reading this speech. It’s the first time I’ve read anything where Pickles appears to blame the system he and his predecessors are responsibility for, rather than the poor bloody foot soldiers (the planners) for the problems he now perceives as the root of all our ills. He and others might still be wrong with some of their suggested solutions (NHB, community plans, LEP, enterprise zones) , but at least he’s right about some of the causes. I’m still struggling to understand how localism is supposed to work, if central government is going to keep trotting out dictate after dictate about how local government should do things at the local level. The latest ‘suggestion’ is that we should revisit something called s106 contributions because these are holding up development. For those not familiar with planning speak, a s106 is a legal agreement between the local authority (council) and the developer of the land. It can cover a multitude of things, from cash payments to support an existing service, through to the building of affordable housing. S106 payments have a bit of a bad name with some people, as they can be seen as a form of legalised bribery – give me a planning permission and I’ll give you this in exchange. However, the overwhelming majority of s106 contributions are made in order to provide something the community would otherwise not have, thereby making what would otherwise be unacceptable in planning terms, acceptable. A good example of this would be a community centre where one currently does not exist, or even more important to some, a doctor’s surgery, or even a school. Greg Clark has now called for these agreements to be reviewed, in order to get the development industry building again. So, what he seems to be telling us is, ignore the local people and their concerns about the lack of the doctor’s surgery, or the currently over subscribed local school. Ignore the local people who tell that there is a desperate need for a local meeting place in the village, especially if you are going to encourage even more people to come and live here, none of things matter anymore, just as long as things get built. This seems to be completely against the whole ethos of localism and leaves me bewildered to say the least. Especially as I don’t believe for one minute that the removal of a s106 agreement from a particular planning permission would see the brickies and chippies back on that abandoned building site tomorrow morning. The reason that nothing is getting built is because there’s nobody to buy what is built and the reason there’s nobody buying anything is because the bankers are sitting on all the money and won’t lend it to anybody at a sensible rate of interest. Even if there were an element of truth in what Greg Clark is saying and tearing up the s106 did remove a barrier to development, the loss of the facilities provided by a s106 agreement, such as affordable housing, just seems to greater price to pay in the longer term. The needs of the community won’t go away, but the ability to meet them will.